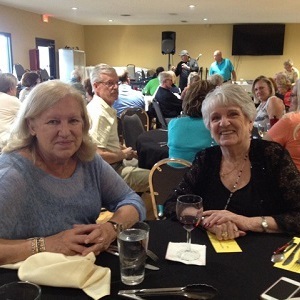 On a lovely September evening, 54 people gathered at the Johnny Mango Event Center in Byron. 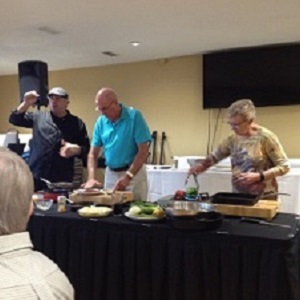 We were there to watch Johnny demonstrate food preparation (with the assistance of some of the guests) and to eat. 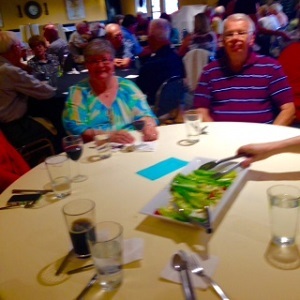 The assistant chefs were Ann Schwalen, Drew Naatz, Judy Plank, and Glenn VanBenschoten. All four performed superbly (though we did not eat the food they prepared but rather food prepared in the kitchen). Johnny told a lot of stories and kept everyone entertained. The favorite course, by far, was the special Johnny Mango Salad - wonderful. The veggies carried the evening - people liked the beef tenderloin medallions and the potatoes but the favorite part of the main course was the grilled onions and other vegetables. We all went home with a little bag of the seasoning used for the vegetables and everyone who attended will get the recipes. Overall, a different kind of experience and a good time.